Guns stolen from dealers often end up in criminal hands. Following a two-year study of gun-trafficking investigations, the Bureau of Alcohol, Tobacco, Firearms and Explosives, or ATF, reported that 14 percent of gun-trafficking investigations involved guns stolen from gun dealers. Guns lost or stolen from dealers are more difficult to trace because there is no record of who initially purchased the gun from the dealer. When these guns are used in crimes, any investigative lead offered by finding the gun at the crime scene goes cold when it is discovered that the gun dealer has no record of who purchased it. Since 2004 Congress has imposed restrictions on ATF in its annual budget that make it especially difficult for the agency to police lost and stolen guns. One such restriction prevents ATF from requiring gun dealers to conduct an annual inventory, a process that would allow dealers to promptly identify and report missing guns. In the administration’s fiscal year 2014 budget request to Congress, however, President Barack Obama requested for the first time that Congress remove this harmful budget rider. This issue brief presents the aggregated data on guns that are lost and stolen from dealers each year, discusses example cases of how guns missing from particular dealers have put the public at risk, and explains how Congress has hindered law-enforcement efforts to prevent and investigate thefts from gun dealers. The problem of guns disappearing from gun stores is a substantial one. Between 2004 and 2011 ATF discovered nearly 175,000 firearms missing from dealer inventories during compliance inspections. In 2011 alone ATF discovered that 18,429 guns were unaccounted for during the course of 10,416 firearms-compliance inspections. Additionally, about 50 percent of gun dealers were found to be in violation of at least some federal regulations in 2012. And these numbers likely account for only a small portion of the guns that are lost or stolen from dealers each year. As explained in more detail below, ATF is only able to inspect a fraction of the nation’s gun dealers each year. In 2012, for example, ATF inspected only 19 percent of gun dealers. There are likely tens of thousands of additional firearms missing from the inventories of dealers who have not recently received an ATF inspection. In addition to these aggregate numbers, there are many noteworthy examples of gun dealers failing to maintain control of their dangerous inventory. ATF conducted a compliance inspection of Valley Gun in 2003 and discovered that 422 guns were missing—more than a quarter of the store’s entire inventory. Additionally, this store was connected with more than 483 guns found at crime scenes, including 41 assaults and 11 homicides. For these and other violations, ATF eventually revoked the owner’s federal firearms license, although he was permitted to continue selling the guns in the store’s inventory as a private seller. A 2010 ATF inspection of Ludco Gun Shop revealed that 997 guns were missing from the store’s inventory. ATF inspectors found numerous other violations of federal firearms laws, such as 93 firearms in the inventory that had not been properly logged into the store’s record books and sales to felons. This audit inspection led to an undercover investigation of Ludco, which revealed numerous additional criminal violations, including numerous sales to felons and straw purchasers. Ludco’s owner pleaded guilty to numerous federal firearms charges and was sentenced to four years in prison. ATF conducted its first compliance inspection of Taylor’s Trading Post in more than 30 years in January 2010 and discovered that the store’s owner could not properly account for more than 3,000 guns that had been bought or sold during the previous three years. After an extended investigation, ATF concluded that 168 firearms were missing from the store’s inventory. ATF revoked the store’s federal firearms license, although it remains open pending various appeals. ATF inspected Bel Air Gun Supply & Pawn in 1999 and found that 86 guns were missing from the store’s inventory. Although ATF recommended annual inspections going forward, the gun shop was not inspected again until 2005. During this inspection, ATF found 817 violations of the Gun Control Act, including 124 guns missing from the store’s inventory. ATF revoked the dealer’s federal firearms license in 2006, and a federal magistrate judge upheld the revocation. The store’s owner, however, sold the business and its assets to his wife, who obtained a new federal firearms license and continues to operate the store. Inspections in 2008 and 2009 reportedly found additional violations of federal regulations. During a 2003 inspection of Franklin Gun Shop, ATF discovered that 677 guns were missing from the store’s inventory with no record of their sale. A more detailed investigation by ATF determined that 336 of these guns were stolen. ATF revoked Franklin’s federal firearms license because of these violations, and a federal court upheld the revocation. Beginning in 1990 ATF conducted numerous inspections of Willingham’s Sports and each time found that multiple firearms were missing from the store’s inventory. In 1992, 27 guns were missing; in 1999, 130 guns were missing; and in 2001, 25 guns were missing. Following the last inspection, ATF revoked Willingham’s federal firearms license, and a federal court upheld the revocation. During a 2003 ATF inspection of American Arms International, inspectors discovered that 427 guns were missing from the store’s inventory and not accounted for in the disposition records. Further investigation by ATF determined that 146 of these firearms had been either lost or stolen. For this and numerous other violations of federal laws and regulations—which a federal appellate court described as “staggering”—ATF revoked the dealer’s license, and the federal courts upheld that decision. During a 2009 ATF inspection of Champion Arms, the inspector discovered that 58 guns were missing from the store’s inventory and could neither be located nor accounted for. Because of this and numerous other violations, ATF revoked Champion’s federal firearms license, and a district court affirmed this action. ATF inspected KY Imports in 2000 and discovered numerous violations, including 79 guns missing from the store’s inventory. ATF issued KY Imports a warning, but a subsequent inspection in 2003 determined 77 guns to be missing. Following this inspection, ATF revoked the dealer’s federal license, and a federal court affirmed this action. ATF inspectors in 1990 discovered 142 guns missing from the inventory of Amory Pawn & Gun Shop and unaccounted for in the store’s disposition records. At a subsequent inspection in 2002, 123 guns were missing from the inventory. For these and other violations, ATF revoked the dealer’s license, and a federal court upheld this action. Elliot’s Gun Shop caught the attention of federal law enforcement in 2007, when guns sold by the store began appearing at crime scenes in the New Orleans region in large numbers. Between 2002 and 2007, 2,300 crime guns were traced to the store, which included guns linked to 127 homicide investigations and 517 drug-related crimes. The owners of Elliot’s were charged with various crimes relating to their management of the gun store, including falsifying sales records to enable sales to prohibited purchasers. Had ATF been permitted to require Elliot’s to conduct an annual inventory reconciliation, the agency may have been alerted to these illegal practices sooner and prevented the diversion of many of these guns to criminals. ATF had conducted periodic compliance inspections of Breit & Johnson Sporting Goods Company since 1977, each time finding numerous violations of federal firearms laws, including failure to properly complete acquisition and disposition paperwork. During an inspection in 1998, ATF inspectors found continued paperwork violations, including discrepancies in the records regarding the disposition of approximately 2,000 guns that had been taken into inventory. For these repeated violations—and upon finding that Breit & Johnson was the source of the second-highest number of crime guns among dealers in Illinois—ATF revoked Breit & Johnson’s license. A federal court affirmed this action. During a 2005 compliance inspection, ATF inspectors found Howell’s Gun Shop to be in violation of numerous federal firearms laws and regulations. Of particular concern were 279 guns missing from the dealer’s inventory with no record of having been sold. ATF commenced revocation proceedings, and Howell’s ultimately admitted to this and other violations and entered into a settlement agreement revoking the store’s license. ATF conducted a compliance inspection of Leroy’s Big Valley Gun Works in 2004 and found numerous violations, including the failure to properly keep track of and record the disposition of approximately 1,200 guns from its inventory. ATF commenced proceedings to revoke the store’s license, and Leroy’s admitted to the charged violations and entered into a settlement agreement revoking its license. 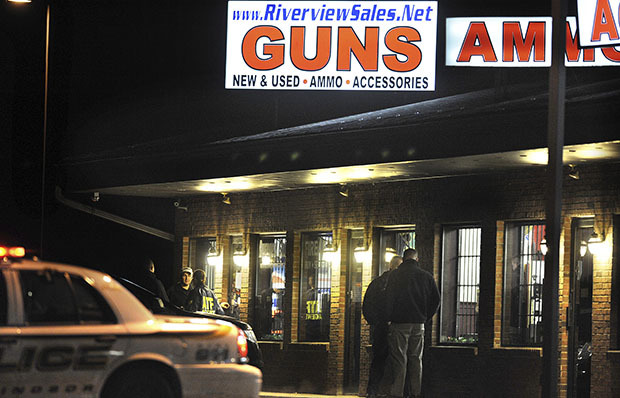 ATF inspectors took a close look at Riverview Gun Sales following the Sandy Hook Elementary School shooting, when it was discovered that Nancy Lanza, the shooter’s mother, purchased the guns used in that attack from this dealer. While no illegalities were involved in the purchase of those guns, during their inspection of Riverview in December, ATF inspectors discovered that the dealer had a history of losing track of weapons in its inventory, as well as gun thefts by employees and customers. The day after the Sandy Hook shooting, a man was arrested at Riverview for stealing a .50 caliber firearm, and further investigation revealed that he had stolen a second gun from the store four days earlier and nine additional guns from the store in 2011. The store’s owner said he was unaware of these thefts and was described by a local detective as “nonchalant” and “a very non-caring gun owner, very lax in his paperwork.” For these violations, ATF initiated a revocation action against Riverview on December 20, 2013. ATF should have the authority to require federally licensed gun dealers to regularly reconcile their inventory with their acquisition and disposition records to ensure that all guns are accounted for and that all missing guns are promptly reported to law enforcement. Congress should act this year to remove the appropriations rider that prevents ATF from exercising this authority. Doing so will give ATF a crucial tool for effectively regulating federal firearms licensees and ensuring that guns don’t continue to go missing from gun stores in such alarmingly high numbers. President Obama indicated his support for this measure by omitting this rider from his 2014 budget proposal. The NRA argues that requiring licensed gun dealers to maintain an inventory would be unduly burdensome on law-abiding dealers. Despite these protestations, however, gun dealers themselves are not universally opposed to inventory checks. In fact, Walmart, the nation’s largest retailer of guns, voluntarily implemented strict inventory controls and quarterly inventory audits in 2008. Maintaining accurate inventory records is a routine and uncontroversial business practice in nearly every other retail industry. Any burden on lawful dealers—who are likely already keeping these records as part of a good business practice—is far outweighed by the benefit to public safety of quickly identifying missing guns and reporting them to law enforcement. Arkadi Gerney is a Senior Fellow at the Center for American Progress. Chelsea Parsons is Associate Director for Crime and Firearms Policy at the Center.